We at Lightwood are proud to have our own CEREC unit on site and are the only practice with CEREC within Buxton and North Derbyshire. We believe that it is the most conservative, accurate and efficient way of restoring teeth with crowns, inlays or veneers available and to date we have restored over 4000 teeth with this technique! Imagine a dental practice where you can go and have your new crown or veneer made and fitted during a single visit and within a couple of hours. 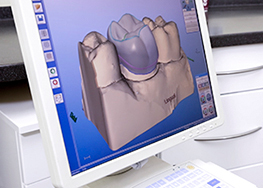 This is what CEREC technology by Sirona Dental Systems has made possible. Your dentist will prepare your tooth in the normal way he/she would before fitting a crown or a veneer. At this point, instead of using “dental putty” to take an impression of your tooth, a digital image is taken using a special camera. This image is then converted into a 3D computerised model of your tooth, which is used as a guide to design your new restoration. 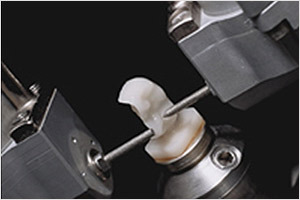 Once your dentist is happy with the newly designed tooth, this data is sent to an onsite milling machine, which fabricates your new restoration from a high-quality ceramic block. The milling process can take anywhere from as little as 12 minutes to 30 minutes depending on the exact technology and complexity of the tooth.